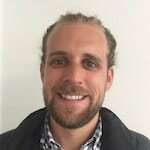 Brad Swain is a behavioral researcher at the Common Cents Lab. There he uses behavioral economics to help low- and middle-income families make better financial decisions. Swain received his master’s degree from the University of Miami’s Abess Center for Ecosystems Science and Policy in 2016. His research at the University of Miami focused on how scarcity changes the way low-income individuals evaluate risk and uncertainty. Before working with Common Cents, Swain was a researcher at the Center for Research on Environmental Decisions and the Higgins Lab at Columbia University. While at Columbia, Swain conducted research on risk and moral decision making. He also helped Dr. Ben Orlove build GlacierHub.Org, which seeks to expand and deepen our understanding of glaciers. When not at Common Cents, Swain still likes to do research! He has worked with the Reducetarian Foundation to help encourage people to eat less meat and The Think Tank to help accelerate diverse participation in STEM. Automated 21st century financial tools, such as bill pay, are meant to make life easier. But for low-income customers and those with uneven cash flow, the need for control of their money can outweigh these benefits. Kristen Berman and Brad Swain of Duke University's Common Cents Lab try to reconcile this seeming contradiction.